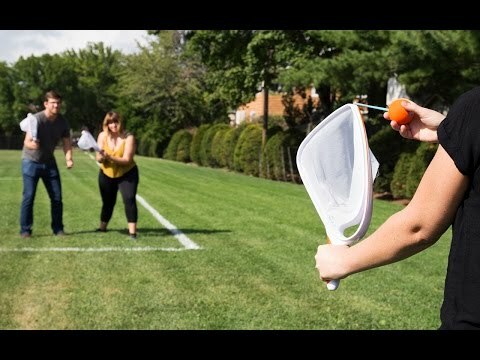 Djubi (joo-bee) is the slingshot toss game that makes classic catch seem underwhelming. Each racket has a deep net for catching and a hook on top to launch the included foam balls. Slip a ball’s latex loop over the hook then pull, point, and release to launch it up to 100 feet. Get your sling on at the park, pool, or beach. Weight: Net (each): 0.5 lb. ; Ball (each): 0.05 lb. They seemed interested, yet to have tried it. Kids loved playing it. The sling shots really travels right over the fence into our neighbor's yard. 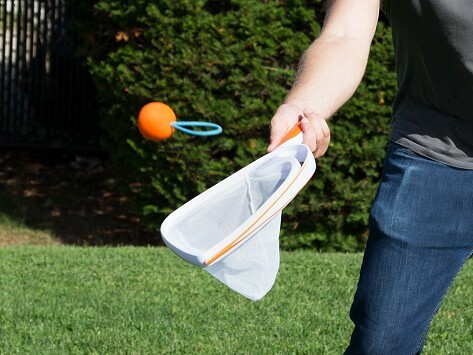 This slingshot toss game was inspired by a kind of flying squirrel that glides across the sky and then lands in its mother’s pouch. It was named after an Aboriginal word for those creatures, too. Each Djubi racket has a soft mesh net for catching the foam balls and a hook on top to launch them. Slip the ball’s latex loop over the hook then pull, point, and watch it fly as far as 100 feet. Djubi (which has a silent “d”) feels both fresh and familiar. Take turns slinging or change it up and invent your own rules. When we tested it here we came up with a version called “Freeze Djubi” where you have to stay in the same place to catch and launch. It’s like your classic game of catch, but 2.0.